AMRICH’s latest summer line at Collage plays with different textures on classic shibori prints. Designer duo Swati and Sunaina’s collection offers a traditional take on everyday wear. 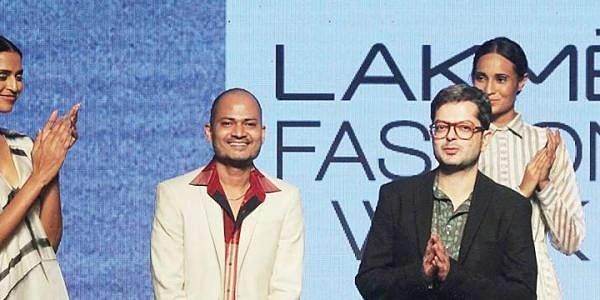 Designers Amit Vijaya and Richard Pandav at one of their shows. CHENNAI: There was a time when designers eloquently expressed their apprehensions about the city’s sartorial sensibilities. For some, Chennai was too traditional and rigid. However, going by the number of design houses that have made an appearance in the city over the last few years, it seems like the tide has finally turned. We spoke to the names behind labels Amrich and Swati and Sunaina, designer duos who are bringing their springsummer line to the city about their designs for the season, their tryst with the city and everything fashion. If you thought that playing with light and shadows is something only an artist or photographer can do, AMRICH’s latest line is here to prove you wrong. Inspired by the concept of Chiaro Scuro, designers Amit Vijaya and Richard Pandav have played with silk and cotton weaves to create lighter and darker textures on their signature shibori prints. “Chennai is a city that understands both textile and craft as well as the painstaking work that goes behind bringing these two spectrums together,” observes Amit. Having showcased with Collage for the last five years, this is the first time the duo are in the city to interact first hand with their clientele. Simplicity, comfort and elegance- we find Amit stressing on these concepts as he shows us his designs. Bold prints against monochrome and pastel palette with patches of blue, the breezy silk cotton garments come in a variety of flowy silhouettes. “We’re bringing down 50-odd pieces in addition to our ramp showpieces which can be made to order,” adds the New Delhibased designer. Interestingly, his favourite garment from the line happens to be a plain white wrap dress sans the shibori, with special focus on seam outlines. Despite a common NID background, the two designers have contrasting tastes in garments and inspirations. “Richard likes to draw from traditional ways of dressing while I am more of a modernist with a penchant for minimalism,” says Amit. Their style differences however arrive at a truce in their common love for geometry. “Shibori as a technique involves a lot of pure shapes. It’s origami on textile,” he notes. While handloom and traditional weaves are a big part of the winds of sustainability sweeping the fashion circuit in the country today, Amit draws attention to the need to be smart consumers. “We don’t believe in making garments that are relevant only for a season. It’s a little insulting even to have your garments thrown away after a season considering the amount of work that goes into each piece,” says the designer as he speaks about the need for a smart wardrobe. “People should buy better but should buy less.” Having completed work on their Autumn-Winter line for the year, Amrich is now working on a capsule festive collection which will hit stores after July. Rs 7,500 onwards. 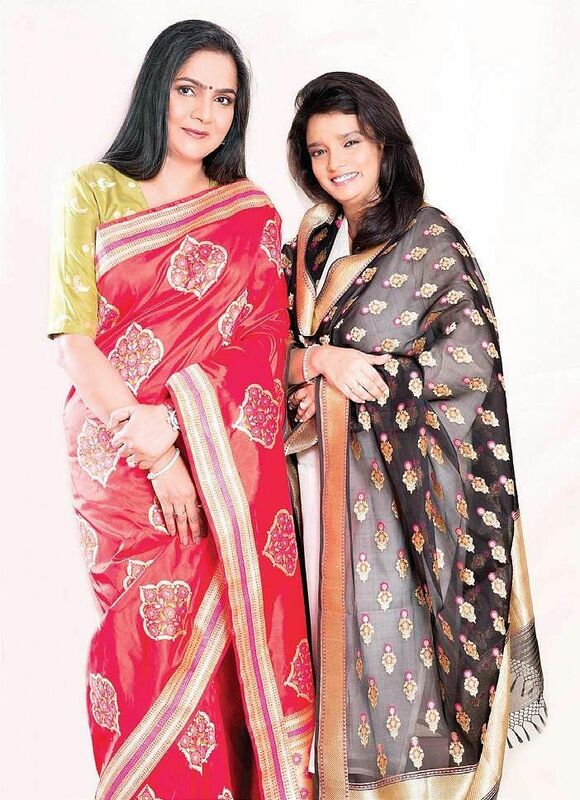 While designers are moving beyond traditional drapes and doing contemporary takes on the sari, designer duo Swati and Sunaina are bringing traditional styles and motifs back in fashion. Their latest offering, Umang, unites traditional designs from all over India with light silk cotton fabric yards. “Our saris re-imagine simple everyday scenes: rain falling on the ground, flowers in our backyards, our household entrances- everything a bride will perhaps see when she sets foot inside her new home,” says Swati Agarwal. Playing with silk and cotton in a particular proportion, the collection features simple motifs set against summer colours like yellows, greens, blues and a range of pastels with the soft, sheer quality of fabric making it a perfect choice for summer wear. Ask her if she oscillates between traditional and contemporary styling for her saris and Swati is quick to add “To each, his own. Youngsters love pairing shirt blouses or off shoulder numbers with their saris while older women generally choose more conservative options. It all depends on your interpretation of the yard.” She picks Megha, a sari that sees the duo’s interpretation of a falling raindrop on fabric as their favourite from the line. As we try to decipher their sources of inspiration, the Kolkata- based designer takes us through the many instances that have made it to the garments on their design tables.